An Inclusive Health Partnership dedicated to ensuring people experiencing disadvantage in Brisbane have access to quality physical, dental, mental health and holistic healthcare services irrespective of their ability to pay. Delivering quality health services that are integrated with other social services is an important part of our vision. 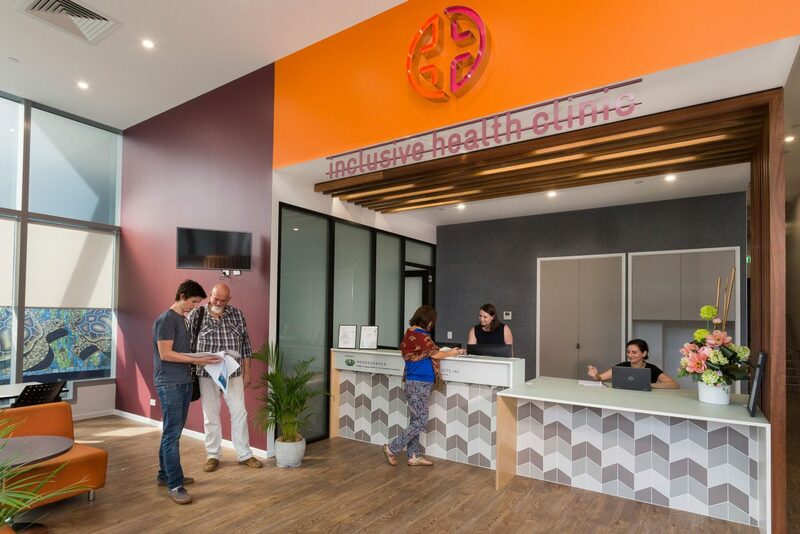 Micah Projects’ Integrated Healthcare provides an integrated, person-centred and trauma-sensitive response to the health needs of vulnerable people in Brisbane, including people experiencing homelessness. We partner with hospitals, community service providers, government departments and funders in the delivery of our integrated healthcare services. For more information please visit the Integrated Healthcare webpage. Many individuals and families continue to be trapped in a cycle of homelessness, often transitioning from unstable accommodation to emergency shelters to rough sleeping. This can continue for many years resulting in a state of chronic homelessness. It does not need to be like this. Homelessness in Brisbane can and should be ended, and any incidents of homelessness that do occur should be rare, brief and non-recurring. Brisbane Alliance to End Homelessness (BAEH) is an alliance of organisations committed to this vision of ending homelessness in Brisbane. The alliance has formed following the successful conclusion of the 500 Lives 500 Homes campaign, which saw a coalition of over 30 government and non-government agencies in Brisbane successfully house 580 individual and family households over a period of three years. The coalition applied internationally recognised, evidence-based Housing First Principles to achieve and then exceed their goal. The success of the 500 Lives 500 Homes campaign demonstrated that homelessness is not inevitable, Housing First principles work in the Brisbane environment, and there is great power in organisations working together to deliver a coordinated approach to ending homelessness. The Brisbane Alliance to End Homelessness seeks to leverage the knowledge, skills, networks and progress made in this campaign. The partners in the 500 Lives 500 Homes campaign developed the Housing First Roadmap, a toolkit for breaking the cycle of Brisbane’s housing, homelessness and mental health challenges. The Roadmap addresses systemic causes of homelessness, while also recognising the value and necessity of reducing homelessness one person, one family at a time. create housing pathways and strategies for women and children who have experienced violence. BAEH have a shared commitment to work with the Queensland Government’s Commitment to Reduce Homelessness in Queensland through the Housing Strategy. The Brisbane Alliance to End Homelessness will work with the Australian Alliance to End Homelessness (AAEH) to measure our progress. Ivan Frkovic BSW MSWAP, Mental Health Commissioner for the Queensland Mental Health Commission is a proud supporter of the BAEH campaign to end homelessness. The Family Inclusion Network (FIN) is a representative group of practitioners, academics and parents with children in care, seeking to progress practice and policy with the statutory child protection system. Areas of interest include the design, implementation and evaluation of family support, child protection and community services. The FIN program was established in Brisbane in 2004 and is auspiced by Micah Projects. The program has since been developed in other Australian states and territories. FIN provide parents and family members with information, support and advocacy. FIN Brisbane has aligned with the government’s agenda to promote family inclusion within child protection services. FIN works with government, groups and community organisations, to ensure parents and family members’ voices, contribute to the development of family inclusive practices recommended through the Carmody Reforms. Micah Projects is part of a consortium of service providers who deliver the Partners in Recovery (PIR) program, supporting individuals with complex needs and severe and persistent mental illness. For more information please visit the PIR webpage in our services section. Brisbane Common Ground at 15 Hope Street, South Brisbane brings together the right ingredients to help tenants make a home. It is affordable, with rent based on a percentage of income. Tenants have the stability of a General Tenancy Agreement and can live in Brisbane Common Ground (BCG) for as long as they meet the terms of the agreement and it remains the housing of their choice. 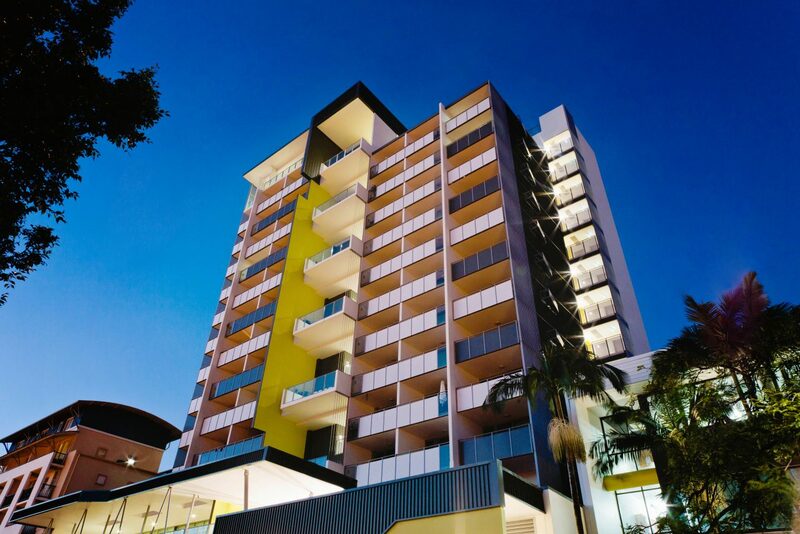 Each unit is self contained, fully furnished, and meets the Queensland Government’s universal design principles. Everywhere in BCG is wheelchair accessible, with 33 adaptable units meeting the standards detailed in AS4299. The building features a range of common areas that help to create small neighbourhoods and provide places where tenants can relax and socialise as a community. Special purpose spaces provide opportunities for activities and recreation. Brisbane Common Ground is an asset to the local community with retail/commercial spaces and a function room and meeting/board room spaces for hire. Brisbane Common Ground, Hope Street, South Brisbane. Photography: Katie Bennett. The ongoing operation of BCG is the responsibility of Supportive Housing Partners, Common Ground Queensland and Micah Projects. Common Ground Queensland provides the tenancy and property management and Micah Projects provides support services to tenants who require it. Both community organisations were strongly involved in the development and implementation of the Common Ground model. Design: Designing or renovating buildings thoughtfully to create a dignified and positive home environment and including in the design community spaces that can be utilised by tenants and the wider community. Permanency and Affordability: Housing is permanent, affordable, and self-contained with rent less than 30% of income. Tenancy Mix: There is a mix of tenants with half being people who have experienced homelessness and half people who have never been homeless. This mix helps ensure a vibrant community and a diversity of tenants. Safety: A concierge service is provided 24/7 to ensure a welcoming but controlled access to the building at all times. Support Services: On site supports including holistic case management, mental health, primary healthcare, recreation and other specialist services to prevent people becoming homeless again and to support people to achieve their goals and aspirations. Social inclusion: Each element of supportive housing from building to support service design aims to create the greatest degree of empowerment and independence for people, as well as a thriving community for tenants and neighbours. Integrated healthcare is a key component of Micah Projects supportive housing services provided at Brisbane Common Ground. Nurses employed by Mater Health, and funded by St Vincent’s Private Hospital Brisbane, Mater Health and Mater Foundation provide seven-day-a-week nursing care as part of the Supportive Housing Hope Street team at BCG. You may like to consider donating a welcome pack of essential household items for one person moving into Brisbane Common Ground. Rachelle, a former Brisbane Common Ground tenant, came to Australia as a 14-year-old refugee and was determined to make a life for herself here in Australia. Photography: Craig Holmes. The building was delivered through a pioneering government-business-community partnership. Funding for the land purchase, design, construction and support services was provided by the Australian and Queensland governments through the National Building Economic Stimulus Plan and the COAG National Partnership Agreement on Homelessness. This is the third Common Ground project that Grocon Constructors completed at cost, with no profit or margin. Micah Projects is a founding member of the Australian Common Ground Alliance (ACGA), a network of organisations working in partnership with government, corporate, philanthropic and community stakeholders to promote and deliver innovative supportive housing solutions for chronic homelessness. 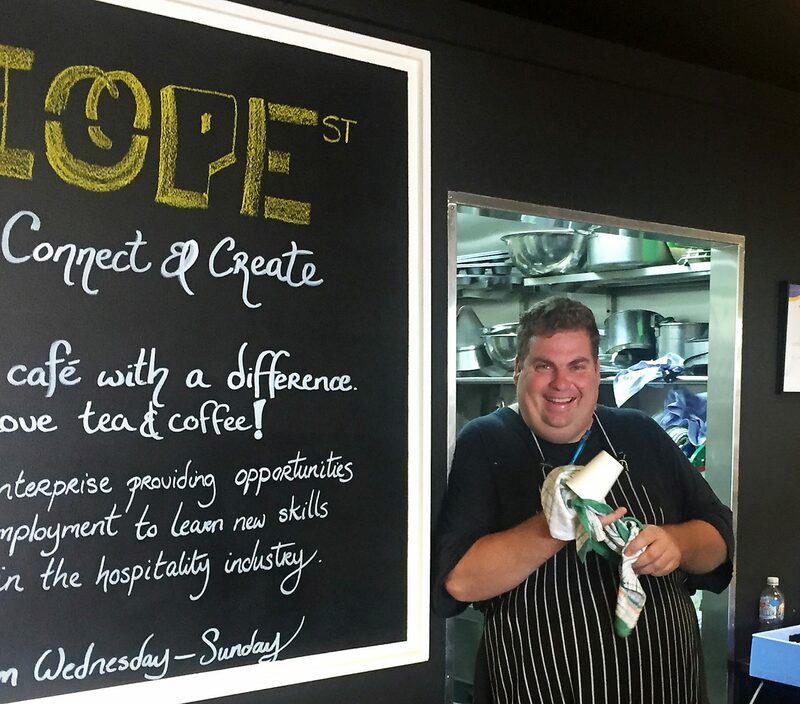 The Hope Street Café is Micah Projects’ first social enterprise project. The café space provides for community and culture, training and employment, and events and exhibitions. The Café is a not-for-profit business connecting the community with people who have been excluded from the workforce, advocating for local food production and a diverse, inclusive local neighbourhood. Jamie, participant at Hope on Boundary Café. Micah Projects is currently seeking volunteer expressions of interest, from people who are experienced or interested in social enterprise, small business, hospitality and marketing, and devoted to good food. Visit the Hope Street Café website. Brisbane Partnerships - Giving a Voice to Vulnerable Families is a three-year collaborative project funded by the Australian Department of Social Services. Until mid-2017 the Partnership will be coordinating activities in a number of important areas to promote social change at both the community and system level. The Partnership is built on long-standing relationships among Brisbane community-based multi-service providers Community Living Association, Jabiru, Kyabra and Micah Projects. We are committed to a community development approach, early intervention and family support within a social justice framework. collaborate with the Family Inclusion Network in South East Queensland (FIN SEQ) to strengthen engagement of parents in all facets of child and family support for those facing challenges in the Child Protection system. Graduates from the inaugural Parent Leadership Training Institute (PLTI) course in Queensland, December 2016. Photography: Craig Holmes. Conducted Parent Cafés and documented the voices of parents talking about what they need to achieve the best for their children. Parents as Teachers – trained staff from partner organisations to facilitate the curriculum and approach to working with families within the context of other program or service delivery structures. Parents as Advocates – resourced and contributed to a Parent Leadership Training course which enables parents who wish to improve the lifelong health, safety and learning for their children, become advocates for children. Brisbane Partnerships continues to support parents who participated in this course which includes providing guidance to parents as they develop and implement their community project. Convened forums and jointly advocated for people with complex needs about how the National Disability Insurance Scheme (NDIS) should support them. Successfully tendered for and continue to conduct the Brisbane Emergency Response Outreach Service (BEROS) for children of families in the child protection system. When we look at the numbers of people experiencing poverty and disadvantage in this city, a worrying picture emerges. A summary of effective parental engagement programs prepared by Lori Rubenstein for the Brisbane Partnerships in November 2015. This report is a review of out-of-home care for children, and includes the contribution of birth parents. Marguerite Casey Foundation This foundation exists to help low-income families strengthen their voice and mobilise their communities in order to achieve a more just and equitable society for all. Washington State Parent Ally Committee This committee is an association of Parent Allies, who have successfully navigated the child welfare system and collaborate to improve outcomes for families entering that system. Community Living Association (CLA) is a not-for-profit community organisation based in Nundah. Its focus is on supporting people with intellectual and cognitive disabilities and young people at risk to get the most from their lives. Jabiru Youth and Children’s Services Association is a community-based, non-profit organisation committed to providing community services and support for children, young people, and families in Brisbane’s northern suburbs. Kyabra Community Association is a medium sized multi-service organisation based in Sunnybank which works with families and communities to strengthen family and community life. Micah Projects is a community based not-for-profit organisation with a vision to create justice and respond to injustice at the personal, social and structural levels in church, government, business and society. Micah Projects provides a range of housing, health and safety support and advocacy services to individuals and families. Brisbane Emergency Response Outreach Service (BEROS) provides outreach and support for young people aged 12-18 who are in care of Child Safety and are self-placing. Community Living Association is the lead agency supporting young people to achieve safety and stability in their housing and relationships with family, friends, culture and community. Kyabra supports young people with access to emergency overnight accommodation. Micah Projects provides transport to safe and appropriate accommodation for young people in crisis and after-hours outreach support to young people in the community. Together with young people we aim to address crisis by connecting with resources and people to create safety and stability as quickly as possible. 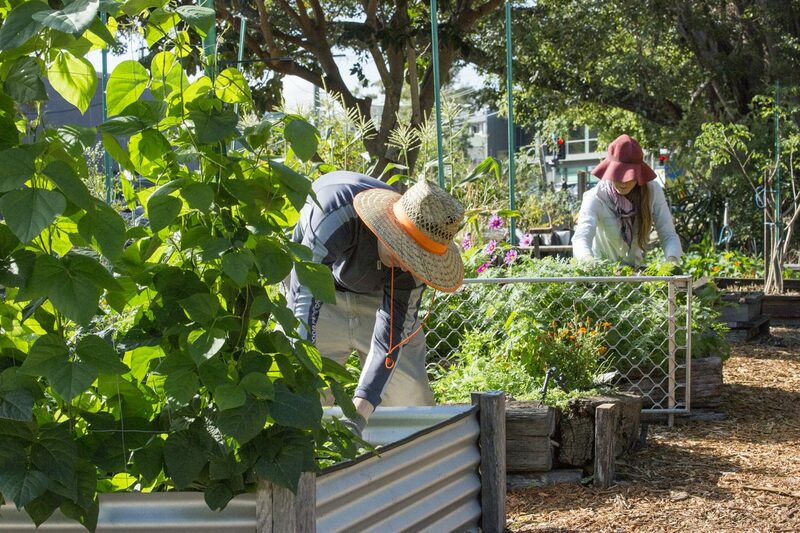 Jane Street Community Garden in West End, is a not-for-profit community organisation. Micah Projects provides coordination and administrative support for the garden. Jane Street Community Garden Coordinator Melissa Smrecnik and Garden Volunteer Chris Strohfeldt tending the garden on a sunny winter’s day. Photographer: Craig Holmes. The Community Garden is dedicated to nurturing sustainable living in a city environment. The garden provides an opportunity for people to become involved in organic gardening and permaculture through volunteering and/or financial contribution. Micah Projects, especially The Hive team, supports people to participate in garden activities. The garden has been operating for 10 years and grows around 200 varieties of organically-grown edible plants. Reclink Australia is another partner supporting the aims of the Jane Street Community Garden. To find out more about the garden please visit their dedicated website. To find out more about the 500 Lives 500 Homes campaign please visit the dedicated website. You may like to consider donating a welcome pack of essential household items for an individual or family moving from homelessness. Donations are always appreciated and those over $2 are tax deductible. 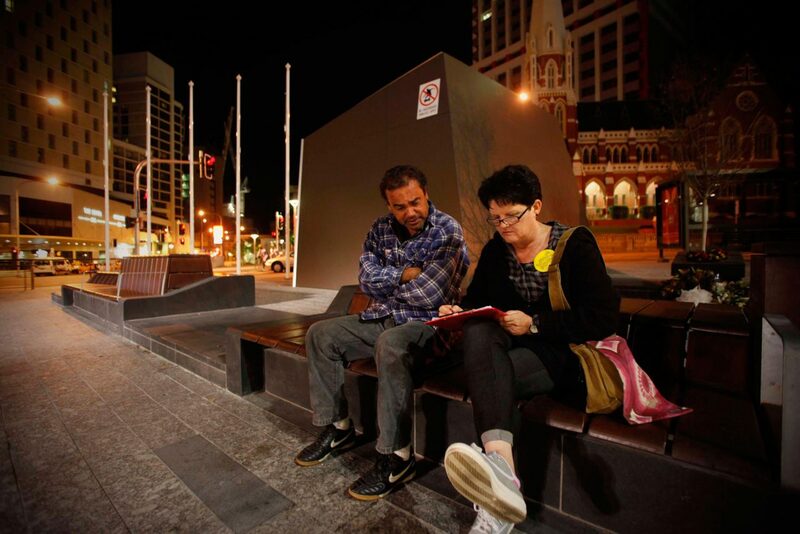 A campaign to house and support people who are homeless in Brisbane. A total of 701 people had been surveyed with the Vulnerability Index about their housing, healthcare and support service needs. 230 people had been housed by the 50 Lives 50 Homes campaign partners. A new campaign 500 Lives 500 Homes began with a community-wide registry from Monday 24 March – Friday 4 April 2014. It is a three year campaign to break the cycle of homelessness for families, young people and adults in our community who are homeless or vulnerably housed. Link to 500 Lives 500 Homes website. The 50 Lives 50 Homes campaign to house and support Brisbane’s vulnerable people experiencing homelessness was launched in June 2010. Micah Projects is committed to meeting the targets set by government to reduce overall homelessness by half and offer housing to all people who sleep rough by 2020. Our colleagues at Common Ground (now known as Breaking Ground) in the USA developed a targeted outreach strategy for the first stage of this work: creating a register of all people who are sleeping rough and prioritising those whose health is most at risk by remaining homeless. Starting with the people who are most entrenched in homelessness made sense and we decided to set achievable targets of housing fifty people at a time, or ‘bite size chunks’, as Becky Kanis from Common Ground Los Angeles would say. Completing the Vulnerability Index survey during 50 Lives 50 Homes registry week in June 2010. Photography: Patrick Hamilton. Common Ground developed a tool called the Vulnerability Index, based on research by Dr Jim O’Connell from the Boston Health Care for the Homeless program into the key mortality risk indicators that are prevalent in people who experience long term homelessness. As well as collecting the name and age of homeless individuals and their health status, the Index captures data on their institutional history (prison, hospital, military, etc. ), length of homelessness, crisis accommodation use and previous housing situation. During the week of 7 June, 2010 Micah Projects support and advocacy workers were joined by outreach workers from other agencies and scores of community volunteers to administer the surveys. We went out at 4am in a methodical canvassing of places where people sleep rough in order to meet people before they left the space for the day. Respondents who consented were photographed where they slept for future identification which aids in guaranteeing consistency among teams of outreach workers. Once the data was collected, it was entered into a database and people were then ranked according to their age and prevalence of health indicators. This informed the decision making process when matching available resources in housing and support services to an individual’s need. 50 Lives 50 Homes volunteers on the streets before dawn, June 2010. The results of the survey were astounding and demonstrated the high degree of disability and the incredible length of time spent homeless by the people we met: one man had been homeless for 40 years. Half of the people surveyed were found to be ‘vulnerable’, meaning they had been homeless for over 6 months and had at least one of eight major health risk indicators, such as end-stage renal disease and multiple recent hospitalisations. These results provided the information necessary for planning the housing and support needs of each individual. 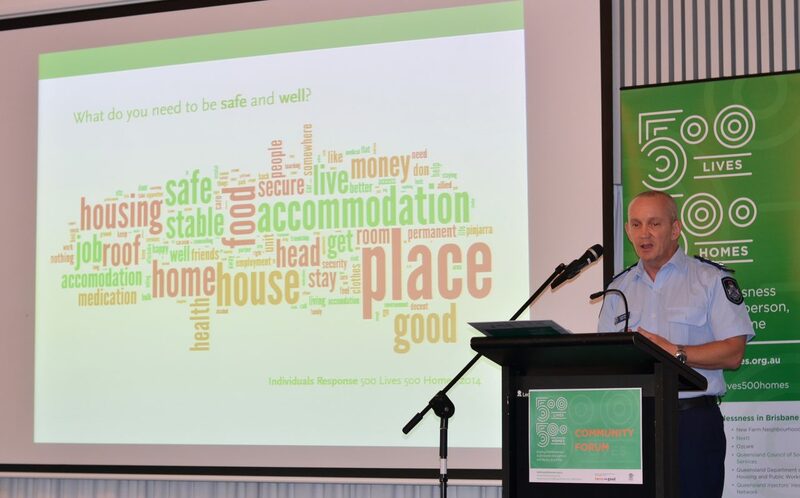 The Registry Week culminated in the Homeless to Home Healthcare Forum where healthcare professionals from all over Australia shared their work with vulnerable people experiencing homelessness. The Forum launched a Network of healthcare professionals and organisations with the intention of advancing strategies aimed at meeting the healthcare needs of vulnerable homeless and formerly homeless adults across Brisbane. We were joined at the Forum (and throughout the week) by Dr Jim O’Connell, Becky Kanis and Beth Sandor from Common Ground LA. Their time, energy and expertise were invaluable to this process and they continued to stay in touch with the campaign. Premier Anna Bligh addressing the Homeless to Home Healthcare Forum, June 2010. Photography: Robyn McDonald. 50 Lives 50 Homes would not have been possible without our partnership with Mater Health Services and the generosity of the Mater Foundation as well as almost 100 volunteers and the parents, students and teachers of All Hallows’ School (who provided a home base and breakfast for volunteers). The next three years were very busy as we worked our way through the register, housing and supporting people and coordinating services that assisted people to maintain their tenancies. With our partners we felt great satisfaction to reach our target of housing 50 vulnerable individuals and families and then move beyond the target. As at 31 December 2013 a total of 701 people had been surveyed with the Vulnerability Index about their housing, healthcare and support service needs. 230 people had been housed by the 50 Lives 50 Homes campaign partners. View 50 Lives 50 Homes brochure. With our partners we began a new campaign 500 Lives 500 Homes with a community-wide registry from Monday 24 March – Friday 4 April 2014.